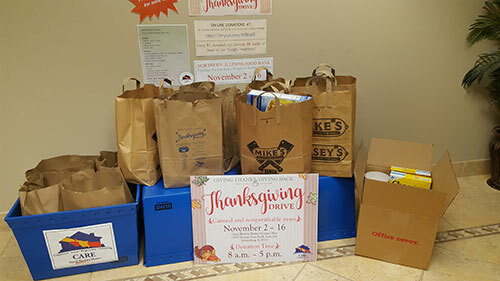 Locally, more than 100 pounds of nonperishable items and $2,000 in online donations were collected during the two-week drive, which ran from November 2 to 16. Chicago team members delivered the items to the organization to distribute to families in time for the holiday. In Chicago, the Thanksgiving Drive benefitted the Northern Illinois Food Bank, an organization that provides nutritious food and innovative feeding programs to more than 71,000 people each week. Team members from David Weekley Homes donated more than 100 pounds of canned and nonperishable food items to the Northern Illinois Food Bank to benefit families in need. The Northern Illinois Food Bank is an organization that provides nutritious food and innovative feeding programs to more than 71,000 people each week.